⚙ D11571 [Battery Monitor] Support "Gaming Input Battery type"
[Battery Monitor] Support "Gaming Input Battery type"
Authored by broulik on Mar 22 2018, 7:51 AM. R120:032fbb83613b: [Battery Monitor] Support "Gaming Input Battery type"
Gives them a nicer icon. The icon does not yet exist in Plasma but gaming-input does, so it falls back to that. 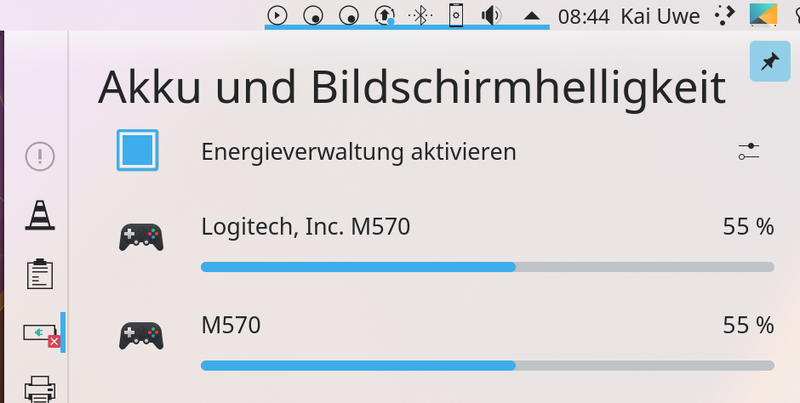 @broulik, does it makes sens, when batteries isn't available (as your screenshot) to be shown, the icon and its percentage of next device in the list, in systray ? broulik added a dependency: D11570: Introduce GamingInputBattery type. D11571 [Battery Monitor] Support "Gaming Input Battery type"